Personalized Chevron Blueberry Dog Collar Made in the USA by Yellow Dog Design, Inc. I am so pleased with my collar. I have had many embroidered collars that never seem to last. The print is preferred and will be more durable. Love the Chevron too! Love this collar!!! He gets so many compliments on it! I like the collars, but I would have liked them much more if the names were embroidered on and not printed. The print cheapens the look. What a cute pattern for a dog collar! The name still stands out nicely, and gives the newest member of our pack some extra pizzazz (as if he needed any). HDC always brings home the bacon! MAKE YOUR BEST FRIEND STAND OUT!! 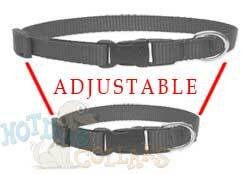 A great collar that makes your doggy wardrobe one step above anyone elses!! You wouldn't want to wear the same boring outfit every day....especially if it looks like everyone else in the crowd! !